Calder studied engineering at the Stevens Institute of Technology (Hoboken, New Jersey, 1915-1919) and pursued his artistic education in drawing, painting, and printmaking at the the Art Students League of New York (New York, 1922-1925). His first experiments with moving toys and wire sculptures date from those years. He travelled to Paris in 1926 and from then on he began a series of frequent trips between Europe and the U.S. He gained recognition in Paris for his mobile toys constructed of wire, wood, and other materials. Among them was Cirque Calder, a circus which included acrobats, jugglers, magicians and different animals which he presented in small shows. His figurative wire sculptures, which look like linear drawings, were presented in his first solo exhibition at Weyhe Gallery (New York, 1928). The toys, with their simple mechanisms, and his oscillating wire sculptures (including the famous portrait of Josephine Baker, 1926) showed an early interest in movement. He also produced sculptures in wood, bronze, and plaster (first figurative and then abstract, but always with great expressiveness) and works made out of gold. After visiting Piet Mondrian’s studio in Paris in 1930, he decided to abandon the figurative style in favor of abstraction. The following year he joined the group Abstraction-Création. His new sculptures, made of pure geometric forms with primary colors built on wood or metal, were presented at the Galerie Percier (Pars, 1931). The following year he returned to movement and he incorporated mechanisms activated by engines and levers to the sculptures he exhibited at the Galerie Vignon (Paris, 1932). 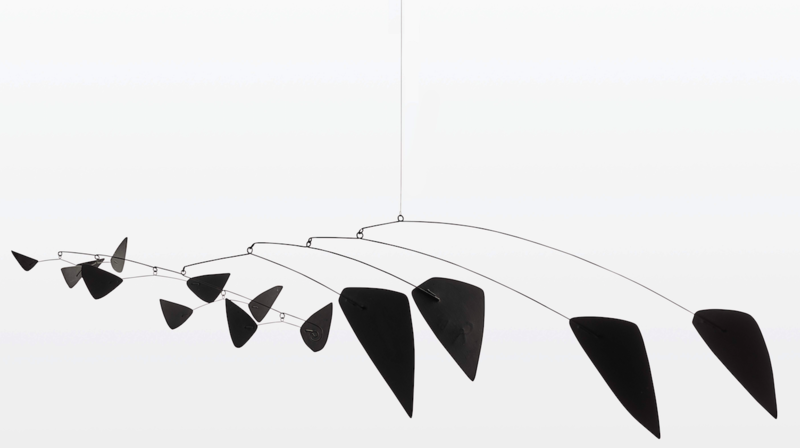 Duchamp called these creations Mobiles and inspired Jean Arp to call Calder’s earlier works Stabiles. Calder liked both terms and from then on he used them to differentiate his mobile works from the static ones. Shortly after he produced works that instead of having a controlled and predictable movement had a more spontaneous one. In 1932 he produced his first Mobile activated by wind. Its forms, united by articulated wires, were no longer geometric but rather organic. With time, he continued to develop different types of Mobiles: to be put on tables, to be hung on walls or from the ceiling, for interiors and exteriors, small and monumental, etc. The Stabiles also continued to evolve towards more organic forms built with large sheets of metal generally painted in black or in primary colors. These two lines of work, one centered on static and heavy forms and the other on movement and change, guided his prolific career. A particular abstraction combining Constructivism and organic shapes in an almost Surrealist manner (probably inspired by Joan Miro) characterized both Mobiles and Stabiles. In 1933, Calder installed his studio at a farm he bought in Roxbury (Connecticut, United States). Between 1934 and 1936 he produced the set for choreographer and dancer Martha Graham’s production of Erik Satie’s Socrate. He was also commissioned to create the Mercury Fountain presented at the Spanish pavilion of the Paris Expo in 1937 (today at the Fundació Joan Miró, Barcelona, Spain). While working on his sculptures, he also showed jewelry pieces in London (1937) and New York (1940), with great success. In 1943 he presented the important retrospective Alexander Calder: Sculptures and Constructions at the Museum of Modern Art in New York. At that time metal was scarce due to World War II so he developed the series Constellations, small format pieces built with wood (some painted, some not) and metal wire. These works were included in the exhibition Alexander Calder: Mobiles, Stabiles, Constellations (Galerie Louis Carré, Paris, 1946). In the 1950s he developed the Mobile-Stabiles, hybrid creations in which a Stabile served as the base for a Mobile. In 1952 he was awarded the Grand Prize at the XXVI Venice Biennial and the following year he opened a studio in Saché, France, where he worked when not at home in Roxbury. Between 1952 and 1954 he created Nubes (Clouds) for the acoustic roof of the Aula Magna of the Ciudad Universitaria de Caracas (Venezuela) as part of a project led by architect Carlos Raúl Villanueva. He continued to produce monumental works integrated with architecture and urban environments and became one of the main proponents of the display of sculptures in public spaces. Some of his most important commissions include Water Ballet (General Motors Technological Center, Detroit, 1956), Flight (Idlewild Airport, today John F. Kennedy International Airport, New York, 1957), The Whirling Ear (United States Pavilion, Brussels Universal and International Exhibition, 1958), Spirale (Palais de l’UNESCO, Paris, 1958), Teodelapio (Spoleto, Italy, 1962), Four Elements (Stockholm, Sweden, 1962), Le Guichet (Lincoln Center Plaza, New York, 1965), Trois disques (Montreal, Canada, 1967), Stegosaurus (Hartford, Connecticut, United States) and El Sol Rojo (Estadio Azteca, Mexico, commissioned by Mathias Goeritz for the XIX Olympic Games, 1968). Alexander Calder. 1898-1976. Paris: Musée National d’Art Moderne, 1966. Alexander Calder. New York: Museum of Modern Art, 1951. Alexander Calder. New York: Whitney Museum of American Art, 1976. Arnason, H.H. New York: D. Van Nostrand, 1966. Arnason, H.H. and Mulas, U. New York: Viking Press, 1971. Bourdon, D. Alexander Calder. Mobilist/Ringmaster/Innovator. New York: Macmillan, 1980. Calder, Alexander and Davidson, Jean. An Autobiography with Pictures. New York: Pantheon Books, 1966. Calder, Alexander. Animal Sketching. Pelham, New York: Bridgman Publishers, 1926. Caradente, G. (ed.). Calder. Turin-Milan: Palazzo a Vela, 1983. Elsen, A.E. (ed.). Alexander Calder. A Retrospective Exhibition. Works from 1925 to 1974. Chicago: Museum of Contemporary Art, 1974. Gibson, M. Paris: Fernand Hazan, 1988. Lipman, J. and Foote, Nancy (eds.). Calder’s Circus. Nueva York: Whitney Museum of American Art, 1972. Lipman, J. and Aspinwall, M. (eds.). Alexander Calder and his Magical Mobiles. New York: Hudson Hills Press – Whitney Museum of American Art, 1981. Lipman, J. and Wolfe, R. (eds.). Calder’s Universe. New York: Whitney Museum of American Art, 1976. Marcadé, J.C. Paris: Flammarion, 1966. Marchesseau, D. (ed.). Calder intime. Paris: Musée des Arts Décoratifs, 1989. Marter, J.M. Alexander Calder. Cambridge: Cambridge University Press, 1991. Sweeney, J.J. Alexander Calder. New York: Museum of Modern Art, 1951. Sweeney, J.J. Alexander Calder. The Artist, the Work. Boston, 1971. Alexander Cader. A Retrospective Exhibition. New York: Solomon R. Guggenheim Museum, 1965.